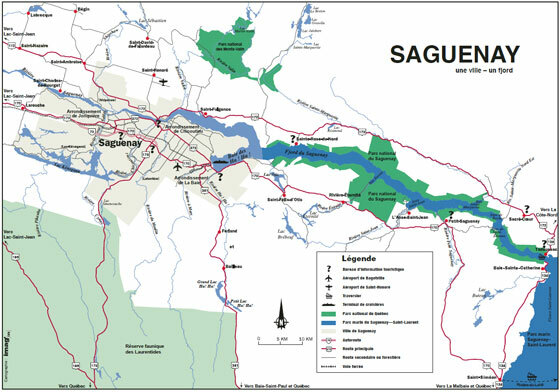 Saguenay was formed in 2002 by amalgamating the cities of Chicoutimi, Jonquire, La Baie, Laterrire and surrounding municipalities and townships. Some shops and restaurants in La Baie can be found on Rue Bagot including a Tim Horton's (Canada's favourite coffee and donut chain). Further west is Les Galeries de La Baie shopping centre with a Maxi supermarket. Be sure to try some poutine. There is usually a small market set up in front of the church a couple blocks south of the pier with a poutine wagon. Cantine Boivin located a block west of the cruise terminal at 1113 Rue Victoria also serves poutine. Tim Hortons and other restaurants and cafes may have free wifi for customers.